It’s the most wonderful time of the year: spoiler season! Shadows Over Innistrad is packed with intriguing card designs and eerie flair. Best of all, Wizards is pushing big-hit, casual tribal archetypes like Spirits and Vampires. We’ve heard rumors about Emrakul being on Innistrad, but I can’t be the only one relieved to not see colorless mana symbols in the Shadows creature costs. Down with Eldrazi! Up with… Spirits! Today, we’ll examine the set’s big talking points and update a ghastly old brew for a fresh new Modern. While Shadows Over Innistrad doesn’t have as many obvious Modern playables as Oath of the Gatewatch, it certainly houses a slew of curious cards that may or may not make it into the format. In keeping with the expansion’s spooky theme, this section gives a card-by-card analysis of the 13 (!!!) cards I find the most worthy of analysis. : Some friends have approached me about including Arlinn in my GRx Moon decks. I’ve long clamored for another 2RG beater to complement Huntmaster of the Fells. Unfortunately, I’m not sure Arlinn is up to the task. She’s definitely worse than Huntmaster, and probably worse than Siege Rhino + Abrupt Decay, which is where I landed in my dork builds. But I like her versatility – against decks without Lightning Bolt, Arlinn starts pumping out a Wolf army immediately; against Bolt decks, she can immediately tick up to four. 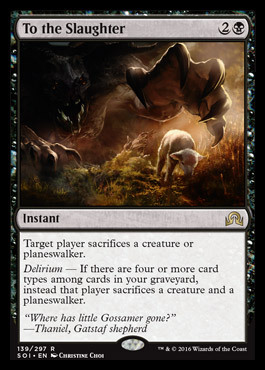 My favorite thing about the planeswalker: she pumps Goyf from the graveyard! : UWx already has the superior Sphinx’s Revelation, and URx combo probably prefers Commune with Lava. That leaves URx Midrange, an archetype that hasn’t existed in Modern since the Twin ban. When it did exist, the comparable Steam Augury saw exactly no play. Epiphany seems a little better than Augury, but the Izzet Fact or Fiction’s utter failure doesn’t bode well for its Shadows rendition in Modern, which also lets opponents choose which pile we take home. : Should Jund reclaim its fun-police throne after the Eldrazi bite a ban in April, I can see this card playing trump in the mirror. Eating Goyf and Liliana with one card should put casters very far ahead, and delirium is very easy to achieve in BGx decks. : Wizards seems to be pushing casual tribal archetypes. We have Gorger for Vampires and for Spirits, and I bet we’ll get a white Human (EDITOR’S NOTE: prediction fulfilled! ), a green Werewolf, and a black Zombie before the dust settles. For his part, Gorger plays so well with my good pal Faithless Looting that I’d be remiss not to mention him. : Four mana has always been a lot for Modern planeswalkers. At her exact mana cost, Nahiri has Ajani to wrestle with, and the Helixing cat already sees very little play. 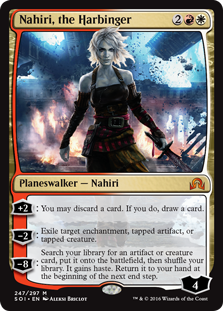 I doubt Nahiri goes places. 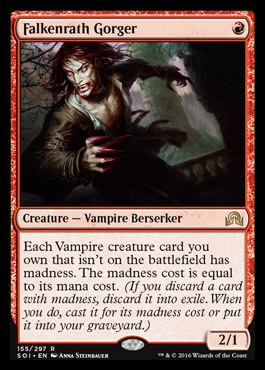 : “A pain beyond description,” reads the flavor text. In a Goblin Guide format, that means three life. Unmaking seems worse to me than Maelstrom Pulse in Abzan-colored decks, but it at least gives other BWx decks a versatile catch-all removal option. : I tested Thing in iGrow when it was spoiled, and was underwhelmed. In that deck – and, I posit, in most URx Delver decks – it’s not really better than Young Pyromancer, who would have made four 1/1s by the time Thing transforms. With Pyromancer, we keep the value even if our two-drop meets Abrupt Decay a turn later. Thing also doesn’t get along with Delver’s other threats, since they all delve, transform, or make tokens. It’s still Bolt-proof, and I can see Thing at least showing up in Storm as a sideboard plan. Thing also interacts favorably with Snapcaster Mage, and I wouldn’t put it past Modernites to develop a competent URx Midrange deck with the card. : Serious card advantage for Zombie tribal decks. Wait, Zombie tribal decks? 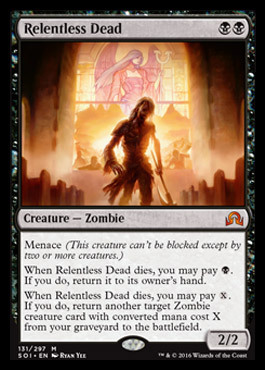 If Dredge doesn’t exist, neither will Zombie tribal, despite how pushed Relentless Dead appears. : Now, that’s support. Bolt-proof with some minimal graveyard enablers, and generates a token every time you cast Gravecrawler from the trash bin. Maybe I spoke too fast on Zombie tribal. 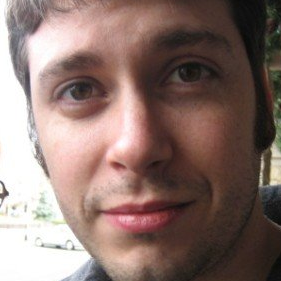 : Remember Choose Your Own Adventure? Heir offers kids a new interactive story… Flip Your Own Delver! My gut tells me Heir asks too much of players for its payoff, since Nivmagus Elemental more or less plays the same way with Phyrexian mana spells and boasts a much higher power ceiling. 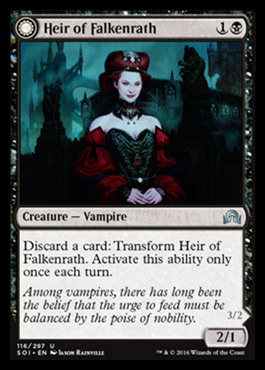 That said, Heir interacts well with madness and other graveyard mechanics, and can be played in a balls-to-the-wall aggro strategy. Delver of Secrets costs less, but bullies players into building spell-heavy tempo decks. : Man, this card really does it for me. 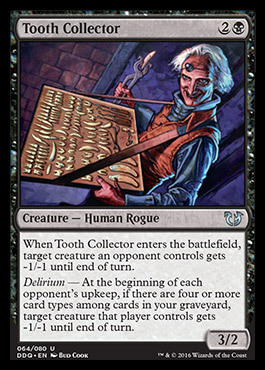 It’s a Rogue, it machine-guns weenies, it has great art, and it has Tarmogoyf delirium! Competes with Orzhov Pontiff in Collected Company decks, but seems sweet in black midrange sideboards should decks like Infect pick up steam after April. : My pick so far for best card in the set, and it’s not close. Company decks may not want it, since often they’d rather spam their namesake instant than worry about stocking the graveyard with card types; that’s the reason they haven’t adopted Oath of Nissa. Traverse fits right into goodstuff spell-based aggro decks à la Delver or Jund. I say “à la” because I don’t predict it making a huge splash in either of those established archetypes; rather, I bet Traverse creates a new midrange toolbox archetype on its own. After all, the only cost for reliably turning this one-mana sorcery into Sylvan Scrying/Eladamri’s Call is playing the best creature in its color – and in the format. : My other favorite card from Shadows Over Innistrad. I’ve been waiting for a Modern-legal Envelop reprint since I played with that card at GP New Jersey last year, and Surgery makes Envelop strictly better by endowing it with the coolest mechanic ever. 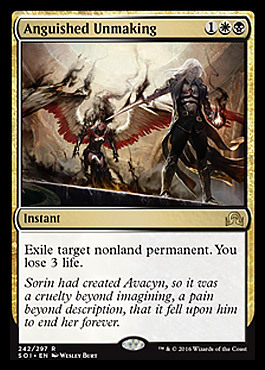 I hope April brings us plenty of Scapeshift, Lingering Souls, and Living End so I can squeeze this card into my airtight Temur Delver sideboard guilt-free. Anyone who reads my columns knows about my pet decks. URx Delver and GRx Moon are both well-documented on Modern Nexus. In truth, I have a couple other decks over a year in the making. You haven’t heard about them because they aren’t any good. Both of these decks share a few qualities: they’re full of read-me cards, they stand to not be playable until we get some serious tribal support, and Tarmogoyf fits into them effortlessly. One is a Rogue Tribal deck focused around Thieves’ Fortune, and the other is Wx Tallowisp. Before we jump into the deck discussion, know that Drogskol Captain‘s omission from this article is purposeful. I have little interest in building a Lingering Souls-centered midrange deck, and have never tested the Captain. For better or for worse, Wx Tallowisp focuses instead on micro-synergies between evasive creatures, card types in graveyards, and the world’s cutest candle ghost. When Theros was announced, I got a little giddy. Finally, a block sure to usher in Tallowisp support! We all know how that turned out. The imminent arrival of and from Shadows Over Innistrad makes a good case for revisiting this archetype, and for leaning towards blue. In the last couple days, I’ve tried Bant, Naya, and Jeskai iterations of Wx Tallowisp, and have come to the conclusion that UW plays smoother and covers more bases than any other color combination. As I tweak the deck, I always keep 33 cards consistent. 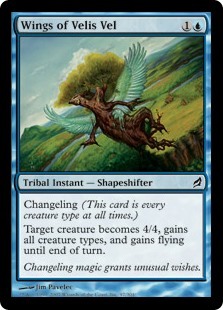 : The card that re-piqued my interest in Tallowisp strategies. ‘s delirium ability further rewards us for packing Serum Visions, as turning it on makes racing tapped-down ground teams in the air a trivial affair. : A card I initially played as a two-of, impressed me so much I bumped its numbers to four. Flash lets us cast it in response to a spell, trigger Tallowisp, search for an Aura with CMC X, and pitch that card to Disrupting Shoal to counter the spell. We can do similar tricks with Shining Shoal, redirecting up to four damage with Angelic Destiny. And we really can’t complain if Rattlechains’s hexproof-granting 187 effect saves Tallowisp from Lightning Bolt along the way. This card’s final line of text is actually hugely relevant in this deck. Giving all our Spirits flash lets us tap down creatures at Start of Combat with , surprise-block with an enormous Fettergeist, or simply hold up Remand and Disrupting Shoal for however much and drop Geist of Saint Traft onto the battlefield before we untap. Geist of Saint Traft: Our boss monster. I’ve never liked this card in Modern, always comparing it to Tarmogoyf. After all, Geist does the same thing in theory: he offers a lot of pressure for little mana. Goyf has Bolt-resistance, and Geist has removal-resistance, but Goyf can switch gears and wall aggro decks while Geist cannot. Furthermore, it’s difficult to profitably block a Goyf in Modern, whereas Geist trades with Goblin Guide and actually gets shut out by Wild Nacatl. For these reasons, Geist of Saint Traft is usually a worse Tarmogoyf. Not so in this deck. 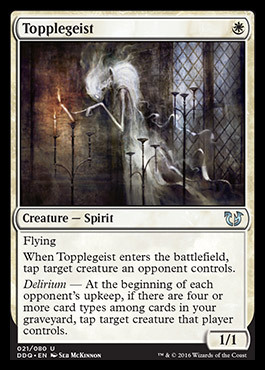 Since Geist is a Spirit, casting him with Tallowisp on board negates his drawback of being blocked by everything – Tallow can search up Steel of the Godhead to put opponents on a relevant clock. In lieu of a Steel, Geist also has notable synergy with in the mid- to late-game, which taps down potential blockers. Hyena Umbra: Makes Tallowisp a tough-to-remove 2/4. Bolt decks will need to shoot him twice, and even that won’t do more than remove the totem armor. Umbra also turns our flying spirits into respectable clocks, sets up a Curiosity slave, and protects Geist from Supreme Verdict effects. Curiosity: Racing linear combo decks with damage isn’t always possible. When we lack a Geist of Saint Traft, it can prove quite difficult to deal 20 damage before turn four. Curiosity lets us carry games with a lowly , poking away and drawing into disruption to slow opponents down enough that we can get there with weenies. 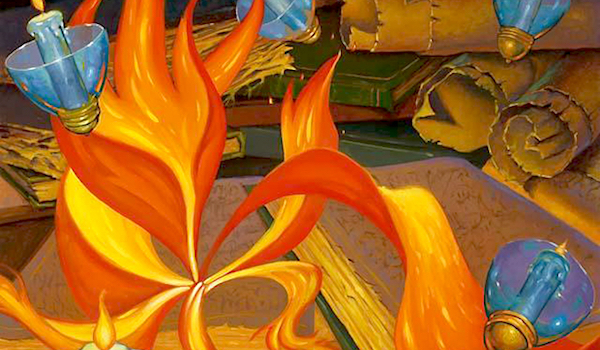 Most of these decks don’t put blockers on the board, meaning Curiosity can enchant something as silly as Tallowisp itself and still do admirable work. In other matchups, the enchantment similarly punishes delayed starts on the board and forces opponents to answer traditionally less menacing threats in a hurry. Temporal Isolation: The searchable removal spell we deserve. Flash synergizes with countermagic and Shoals. Steel of the Godhead: I’ve found Steel quite lackluster when we don’t have Geist of Saint Traft, but I like having the option to Steel a Geist as early as turn four. Still, I might as well mention that I’ve won some games with lifelink on an Umbra-carrying white creature. Path to Exile: Rogue aggro strategies can rarely exist in this format without packing powerful catch-alls. Modern’s most flexible removal spell fits this role perfectly. Disrupting Shoal: As with Path to Exile, I don’t think this deck could exist without Disrupting Shoal. Modern is full of ultra-fast linear strategies, and UW is simply too slow a color combination to handle them all effectively. We’re in the aggro boat ourselves, and therefore lack access to reset buttons like Supreme Verdict. Since Shoal triggers Tallowisp, its drawback hurts us less than it does other decks, and our games usually go long enough to put hard-casting the arcane instant within reach. Vedalken Outlander: An easy aura target since he can’t be Bolted in response, Outlander adds the artifact card type for delirium when he does die. Notably pitches to both Shoals, and fully benefits from Steel of the Godhead. I decided I wanted more interaction in his slots. Meddling Mage: Shares most out Outlander’s benefits, but trades Bolt-proof for a wider disruptive range. Mage tested very well for me, and I would like to find room for him down the road. He shuts down linear combo strategies like Ad Nauseam and Scapeshift, and adds an additional skill-testing dimension to games that I appreciate. Snapcaster Mage: It does feel weird to build a UW deck without Tiago. Unfortunately, Snapcaster doesn’t have that many targets in this deck. Sure, in the way-late game he can flashback Shoals, and the Path-Visions suite might be enough to justify a copy or two. Right now, though, I’d rather have more reliable synergies or disruptive instruments. 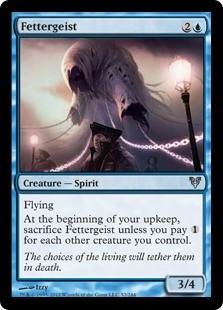 Fettergeist: We all know how big a 3/4 is in Modern. Flying makes Fettergeist play like some mashup of Delver of Secrets and Tarmogoyf. The drawback hasn’t been relevant for me so far, and I love flashing Fettergeist in to block an attacker with out. But three mana really is a world away from two in this format. Remand: I prefer Remand to Mana Leak in this deck. We can fully benefit from the tempo swing it provides, and our curve is high enough that Remand isn’t often clunky. Additionally, once we see the spell our opponent will probably play next turn, we can “prepare” by scrying accordingly with Visions, leaving up Shoal mana, or finding a disruptive Aura with Tallowisp. Shining Shoal: When I tried a Jeskai build of Tallowisp yesterday (obviously, with Mantis Rider), I realized Bolts were often too redundant with Shining Shoal to matter much. Shoal plus any white spell saves Tallowisp from Lightning Bolt, and the card makes combat decisions horrible for opponents. We can also Shoal “nothing” to trigger Tallowisp, paying WW or pitching any white spell to find a key Aura on command. Crib Swap/Wings of Velis Vel: I like these tribal changeling cards because they do so many things – besides having an actual effect, they pitch to Shoals, trigger Tallowisp, and support delirium. Crib Swap seems like the better card at a glance, but Wings of Velis Vel is the one I actually tested. And I didn’t hate it. It grows Geist to 4/4 after opponents declare blocks, saves any of our creatures from a Lightning Bolt, and hard-counters the most widely-played removal spell in the whole format: Victim of Night. (Gotcha!) Wings also pitches to Shoal for two, Modern’s magic number. Crib Swap seems like a much worse Path to Exile to me, so I don’t see ever playing it over Wings if we decide on running tribal changelings. Ojutai’s Command: Okay, I admit – I haven’t actually tested this card. To be honest, spells that cost more than two mana kind of repulse me. Look at all those relevant modes, though. Counter a creature? Draw a card? 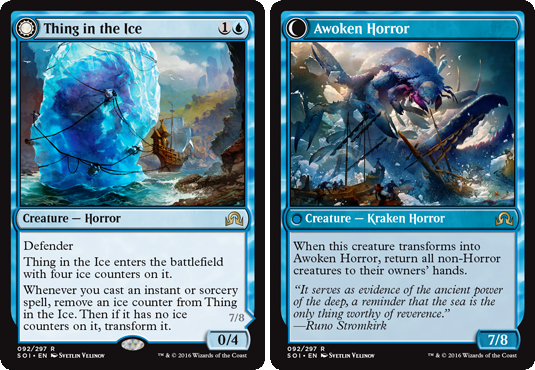 Instant-speed return and tap down that Emrakul your opponent just Through the Breached? Or revive to save Tallowisp from Abrupt Decay?! I can see Ojutai’s Command potentially finding its way in here. But I don’t think Shadows will fail us of its own accord. Power levels aside, the design harkens back to the infamous richness of its parent block. And did I mention the flavor? Shadows even has it at the meta-level. 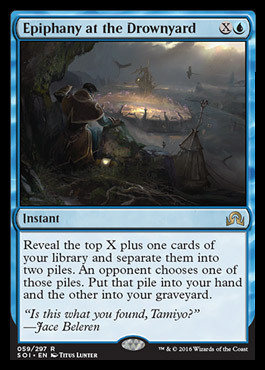 If delirium is any indication, Innistrad isn’t just Delver’s home plane – it’s Tarmogoyf‘s, too! Previous Post: Shadows Over Innistrad Spoilers and Set Release History! This deck is downright spicy – I like it. 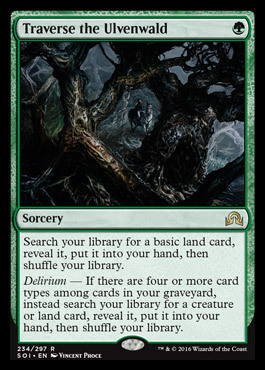 Bonus points for figuring out a shell in which Topplegeist’s Delirium effect will actually become relevant, and for playing Moorland Haunt (one of my pet cards). As far as the auras go, is Daybreak Coronet too win-more to be worth considering? How about Spirit Mantle for evasion? Can’t search Coronet with Tallowisp, unfortunately. Threads of Disloyalty has the same problem, but I pack that in the sideboard to deal with Tarmogoyf, who I grow pretty large incidentally. I have yet to want an evasion-granting aura in my testing, so I’ll leave Spirit Mantle out for now. Ah, I had assumed that it was capable of grabbing those. That’s disappointing. Tallowisp could never find Coronet since it never was just ‘enchant creature’, it always had additional riders that made it an ineligible target. You were able to find Threads when they were printed, but the new Aura rules and template have disqualified it. On the subject of the spoilers – I’m all-in on the Zombie tribal hype right now. That deck just needs another decent 2-drop, and it’ll be a Tier 3 contender with potential upside if people forget to pack their graveyard hate. 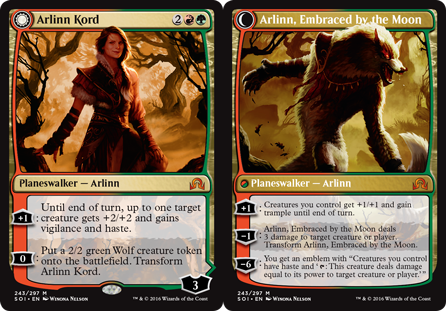 I also think that Arlinn will find her niche in Collected Company Zoo in some form or fashion (probably as a way to weaponize creature topdecks against BGx out of the sideboard). Traverse the Ulvenwald looks awesome, though it might need to have a deck built around it. Everything else I’m mostly with you on. I finally made an account just to comment on this. I’ve had my UW Tallowisp deck on the back-burner for two years now, but never did I consider the merit of Shoals. Thanks for the inspiring tech to get me back on the horse. A fun (though casual) line of play is to utilize Arcanum Wings into Eldrazi Conscription. For those that favor hysterical victories over win percentages, nothing beats an 11/13 Tallowisp monstrosity. I’ve had my casual tallowisp deck in a box somewhere collecting dust since forever, i might give something similar to your list a spin sometime. Can’t wait for the breath of fresh air the release of Soi will release in the format. Not just because of bannings, but for the potential tribal love innistrad will gives us. Lots of sweet stuff, really hoping for zombies, humans, vampire to become a thing. Not being tier 1 or 2 doesn’t matter, as long as people can play their pet tribe and be able to collect a few wins at their local fnm. Hava you considered Aether Vial in this deck? I have, and I tested it. Didn’t like them though. Hierarch (with a G splash) does us a lot of favors, but Vials are clunky in multiples and horrible when we draw them late. Also opens us up to artifact hate, of which Modern has no shortage. Wow this deck looks amazing Justin. I have almost everycard in the deck so im for sure going to try this one out. How often do you think this deck can trigger delirium for topplegeist. I think I will try to test vial in it but maybe you are right that they arent good enough but we will see. What are your thought behind the absense of collonades, cavern and ghost quarter’s? Delirium triggers around turn five if we don’t lose a creature, and around turn three otherwise. Go ahead with the Vials and report back how they fare! I don’t like fancy lands that much. Good mana/not auto-losing to Blood Moon is much more important to me. Yeah my bad wont happen again :p.
Not a bad idea. I haven’t tested it but I assume the Tron matchup is a nightmare. Quarters are better than Moorland Haunt if that’s the case. First, a big thumbs up on the article title! I hope the Ghibli reference was intentional, but if not, I’m still sad somebody got to it before me. In regards to extra evasion for Geist, don’t forget that you can always toss a Temporal Isolation on him to grant Shadow, letting you swing in with near reckless abandon. You lose the 2 damage from Geist, but it’s great for racing with Angel damage. Also, if aggro seems to be a problem, would you consider Azorius Herald? It’s 4 life and an unblockable Spirit to toss some lifelink on? Very glad to see your brewing blood pumping again as April approaches! If Burn and Zoo turned out to be problems, Herald would be great here. I just don’t think that’s what we have to worry about in this format. Geist is definitely bad against Goblin Guide, but I think our Shoals make up the difference. Any love for a singleton Veil of Secrecy to force through Geist and/or return Rattlechains to your hand? Splicing it onto Shoals for additional value? Target creature gains shroud until end of turn and can’t be blocked this turn. Splice onto Arcane—Return a blue creature you control to its owner’s hand. As a psuedo edit to the above. Perhaps plumes of peace is an option too? Fetchable with tallowisp, pitchable to both shoals, taps potential geist blockers. It’s the price you pay for being overcosted. It’s not a good turn three play I grant you. I think Steel of the Godhead and Temporal Isolation, respectively, are better than Veil and Plumes. Those two are just too conditional for my taste. Maybe you could consider a couple of Stormbound Geist in the sideboard, as they do a profitable job in both blocking fliers from Affinity and offering resilience against Liliana. I know they are subpar cards on their own (as all Spirits are anyways, being a deck based on tribal sinergy), but it being able to gain Flash via Rattlechains may get it playable. Stormbound does too little against too many decks, and costs the same as Geist of Saint Traft. I think that card belongs in Pauper. I’d also rather run dedicated sideboard answers to problem decks than subpar mainboard ones.